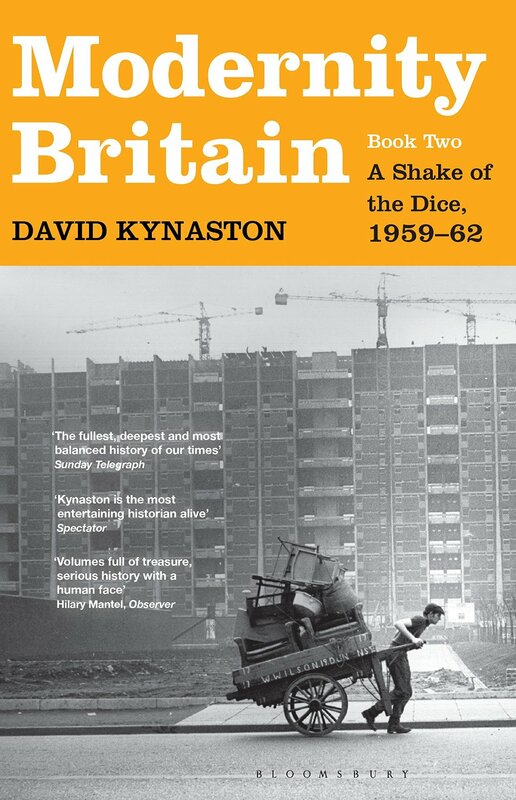 Book review: Modernity Britain Book Two A Shake of the Dice 1959-62, David Kynaston. Published by Bloomsbury. They sometimes say that if you can remember the nineteen sixties, you weren’t there. Well, I genuinely wasn’t there, I know this for a fact. But after reading this, the second part of the third volume of David Kynaston’s masterful collection of books spanning the period from the Attlee victory in 1945 to its bitter denouement in May 1979, I sort of feel like I lived through it. Or at least the first part of the Sixties. For this book takes us to the half way point in Kynaston’s saga. It is a nation in transition. The colossal changes of the Sixties have not quite began at the end of the book. The Beatles are no longer The Quarrymen. They have been to Hamburg but they have not fully taken off yet. Dudley Moore and Peter Cook’s names are getting mentioned but the satire boom has not yet really got going either. John Profumo is still just another minister in the government. Harold Macmillan is still in office although his hold on power looks less secure by 1962 than it did when the book starts after his General Election triumph of October 1959. Labour’s Hugh Gaitskell meanwhile survives a party crisis, a challenge from Harold Wilson and a brief Liberal Party revival after their sensational 1962 Orpington by-election win. But neither Mac or Hugh will turn out to be leading their parties by the time of the 1964 election. This is a nation poised between the “Never had it so good” years and the “white heat” of another Harold’s technological revolution. Big important issues such a immigration, slum clearance, tower block building and the issue of British decline are being faced and in some cases botched. But it is Kynaston’s mixture of the lives of the stars, the stars of the future (new Tory MP Margaret Thatcher of Finchley begins to make her presence felt), the perfectly ordinary which makes these books such a delight. Beloved Dixon of Dock Green actor Jack Warden has an easy solution to the “problem” of a group of teenagers he sees loafing on the street. “Bring back the birch,” he says. This is a marvelous book. Roll on the undoubtedly still more eventful next volume.